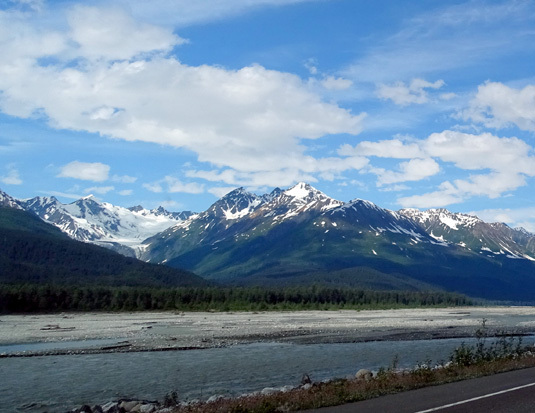 Alaska, with drive-up access to Worthington Glacier." 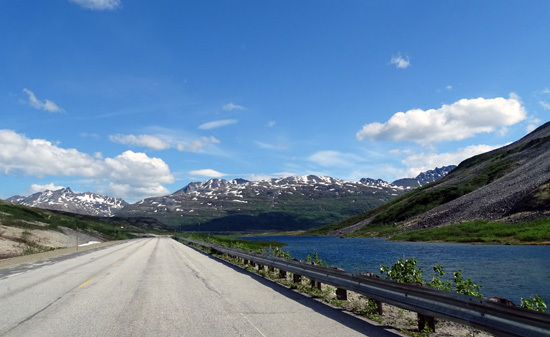 Some of the most scenic views on our two-day drive from Haines, AK through the Yukon and down to Valdez, AK were on the Richardson Highway portion of the route. As the crow flies or the boat floats, it's nowhere near as many miles between Haines and Valdez. Driving over land is a different story. 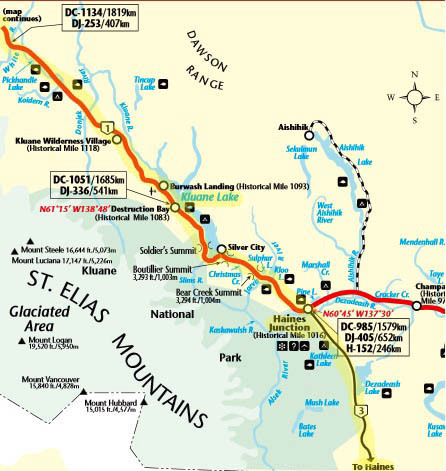 Our route took us around some huge provincial and national parks, preserves, mountain ranges, and ice fields -- all that green on the map above -- offering great views of some of North America's highest and most beautiful peaks. 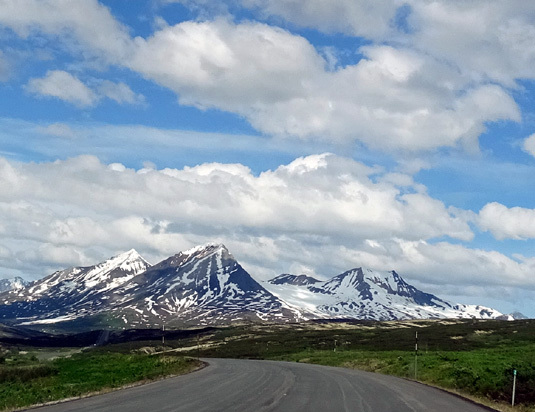 These three photos are along the Alaska portion of the Haines Hwy. 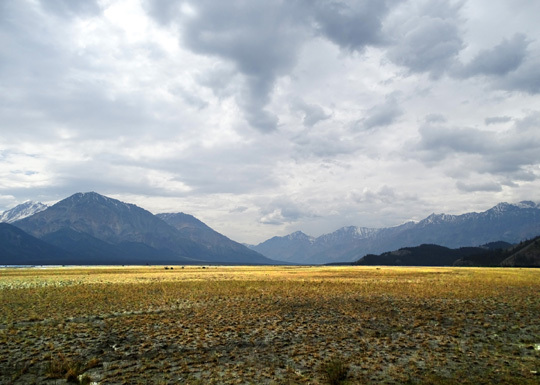 between the Takhinsha and Boundary Mountain ranges. Glacier Bay National Park is just west (left) of here. 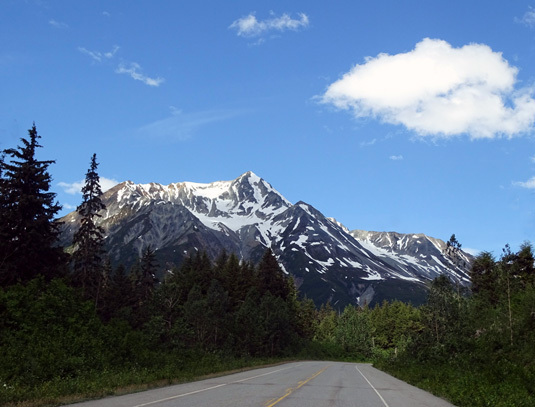 I love all the glaciers in this section of the Haines Hwy. 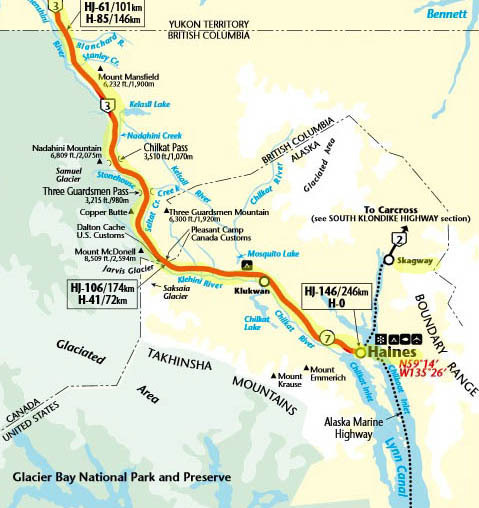 We were happy to have better weather on much of the route from Haines to Valdez than we did in 2012 so we could see more of the mountain peaks and glaciers this time. 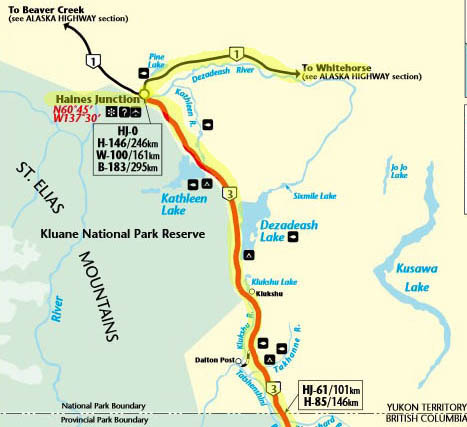 Route: North on the Haines Hwy. 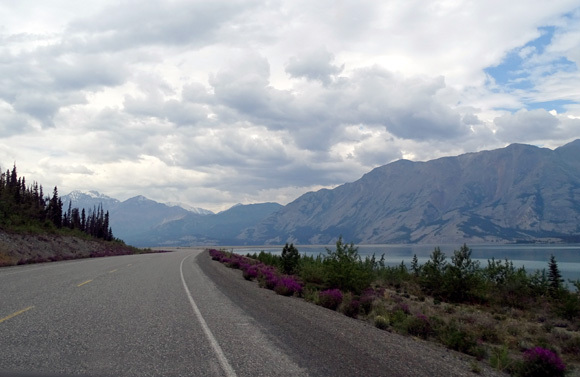 (AK 7), which becomes CA 3 in British Columbia and the Yukon to Haines Jct. 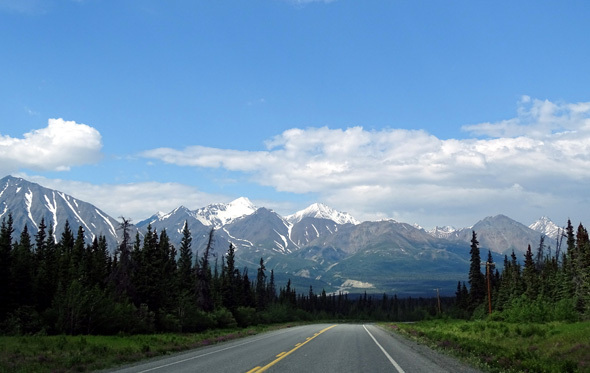 West on CA 1 (Alaska Hwy.) 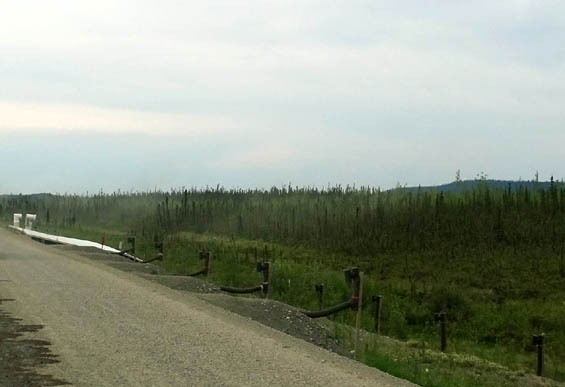 across the Alaska border to the paved pull-off where we finally stopped, about 46 miles east of Tok. 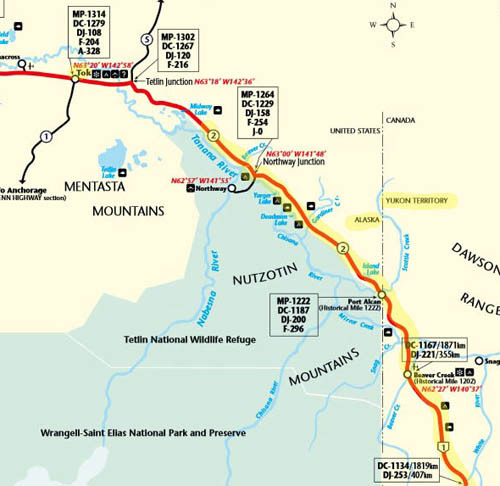 Here are some more detailed maps of this day's drive from The Milepost website. 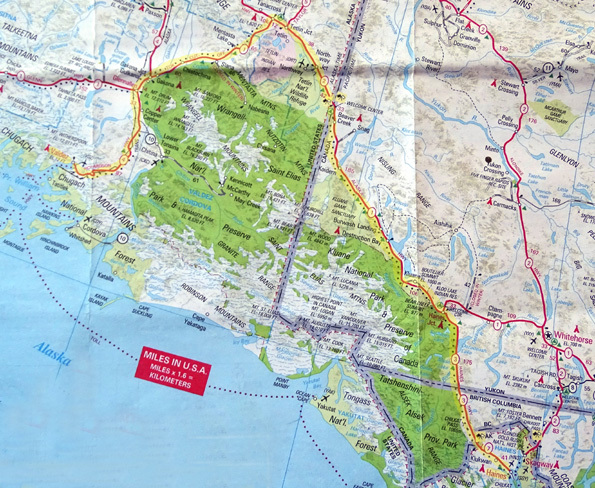 Note that the blue portions are not water, but huge provincial and national parks. It took us about 10� hours with ten or more stops. 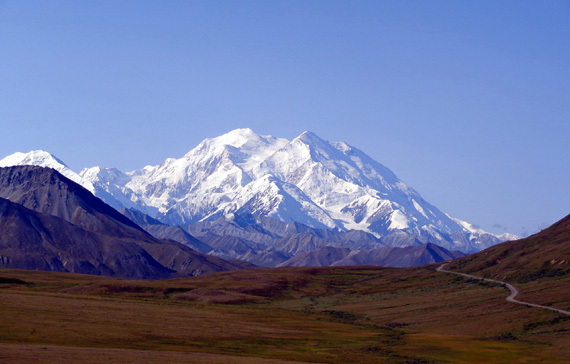 Our revised goal was to reach Tok, Alaska and stay there overnight. Due to road delays and fatigue we stopped about 45 miles east of there. We stopped at several rest areas during the day. 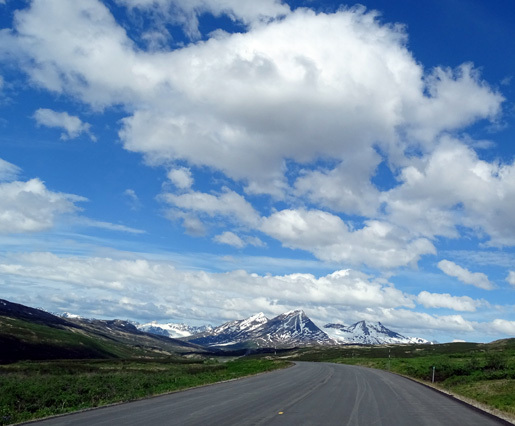 We got fuel in Haines Jct., YT ($1.289/liter CA) and Beaver Creek, YT ($1.599/liter CA, which was more than we paid at the same station three years ago when fuel prices were much higher!). 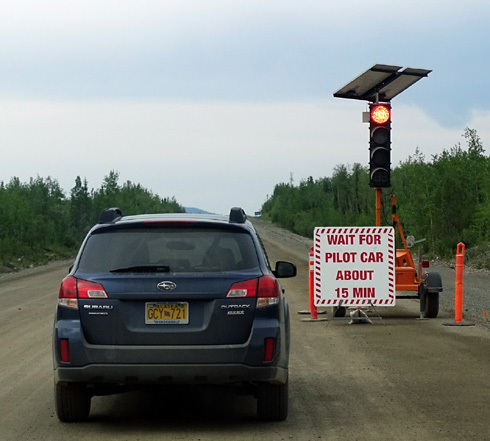 We should have waited until we were in Alaska to get more diesel but we didn't want to risk running out. 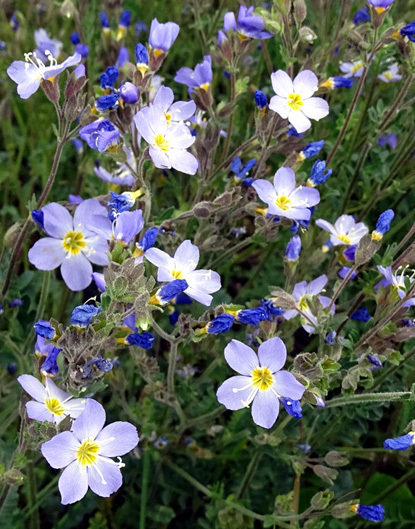 I spotted these pretty flowers at one of the rest areas. 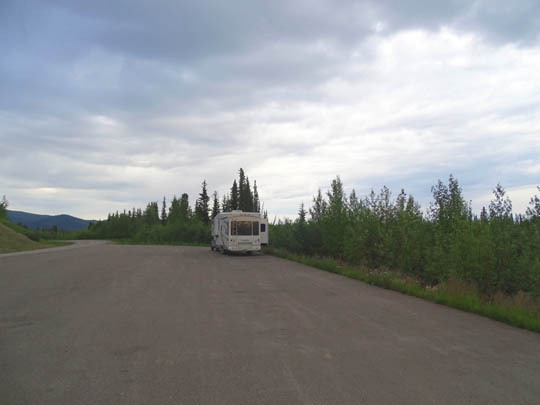 The scenery was less interesting from Burwash Landing, YT to our rest area, which is above the Tanana River. 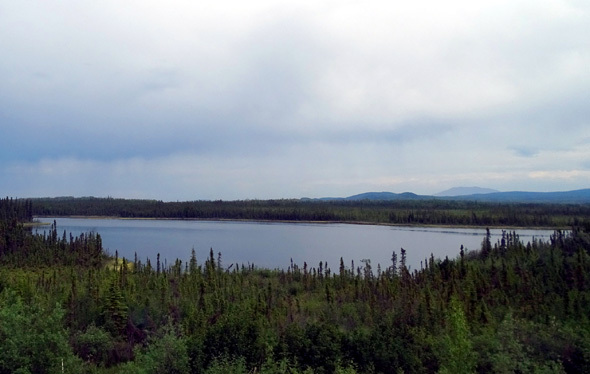 Unfortunately, trees prevented us from seeing the river there but we could see it from other places along the Alaska Hwy. Traffic and road conditions: Traffic was light the whole way. There was more road construction, of course, so some gravel breaks again today. They were OK going a slower speed. 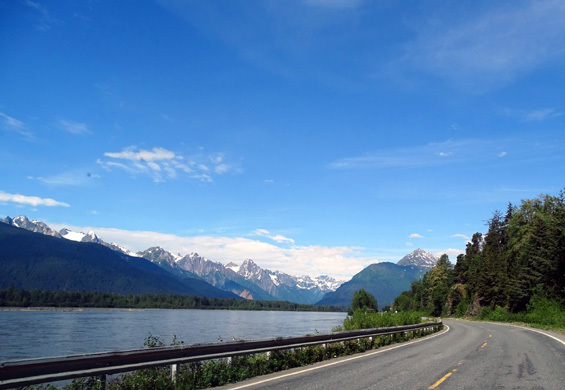 Weather: Mid-60s F. and sunny when we left Haines. 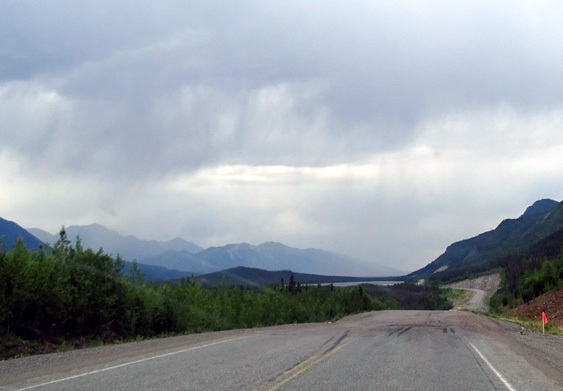 We enjoyed gorgeous weather until it began raining west of Haines Jct., YT. 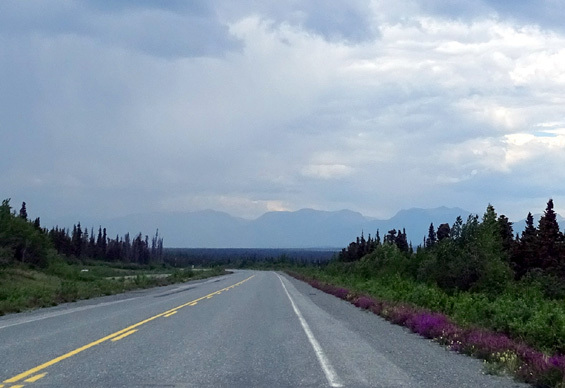 We had rain off and on the rest of the day but the clouds were high enough to see most of the Kluane and other mountain ranges surrounding us. Temps remained in the mid-60s F. all day as we drove north and west. Rain and road construction: just deal with it! 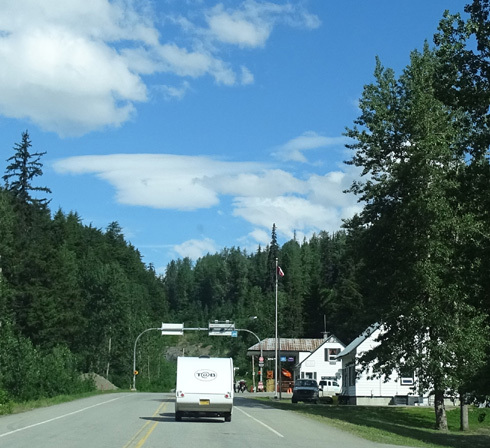 This is the second time we've gone through both Canadian and U.S. customs on the same day (the first was the day we drove down to Skagway, AK from Whitehorse, YT). 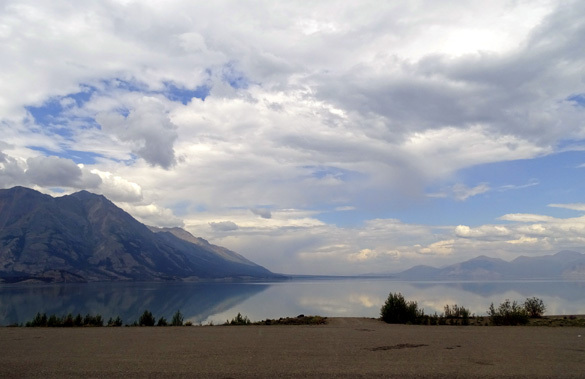 We hit the Canadian border in BC 39 miles north of Haines in the morning, then the U.S. border past Beaver Creek in western Yukon late in the afternoon. 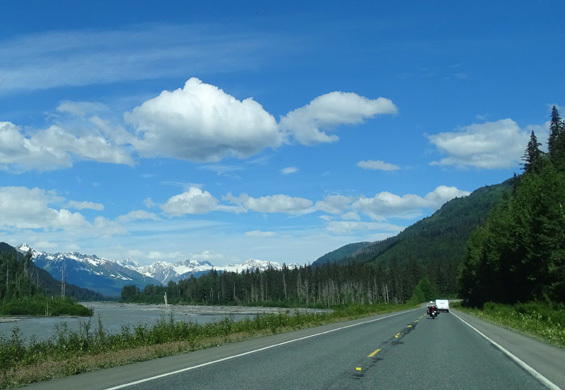 BC border northbound on the Haines Hwy. We didn't have to wait at either crossing, which was nice. 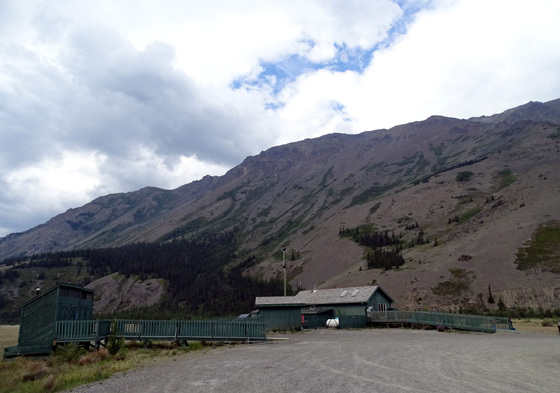 At the Canadian border north of Haines the agent took our passports inside the building to scan them, asked us where we're from, where we're going, how long we'll be in Canada, if we have more than $10,000 on us, and if we had any alcohol, tobacco, or firearms. She spent about as much time playing with Casey as asking us questions! At the U.S. crossing the older woman came outside her window to see the dogs and asked us if we had any treats she could give them (she didn't have treats). Another woman came to the window and gushed over the dogs, too. They ran the passports, asked us about the same questions plus whether we had any food from Canada, and off we went. 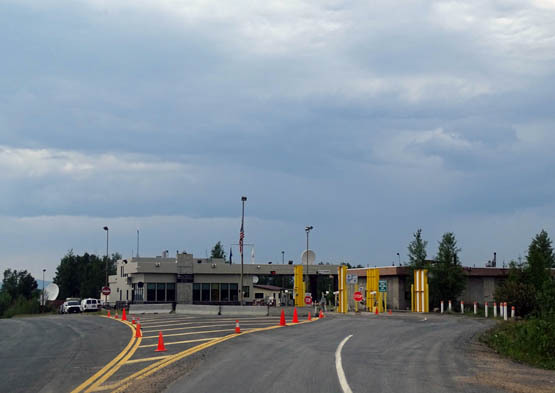 U.S. border crossing westbound on the Alaska Hwy. 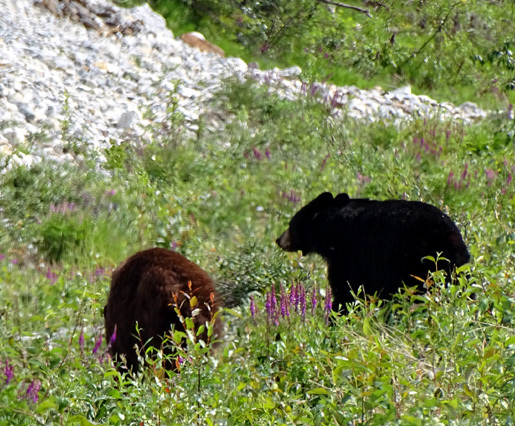 Two young black bears; one is brown. We finally got to go inside the visitor center at Sheep Mtn. 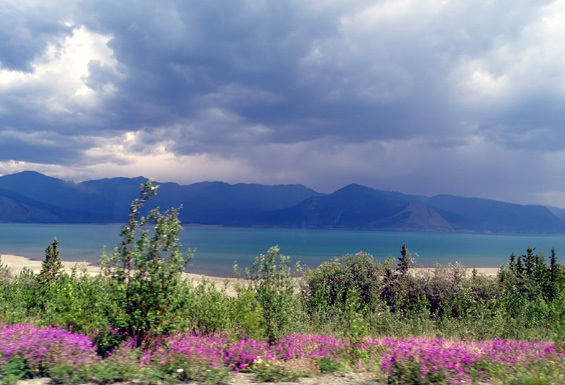 at the southwest corner of Kluane Lake in the Yukon. It was closed the two times we passed by in 2012. We didn't see any bighorn sheep on the mountainside but it made a nice break for us and the dogs. Jim and I went inside the visitor center for a couple minutes to see the displays. 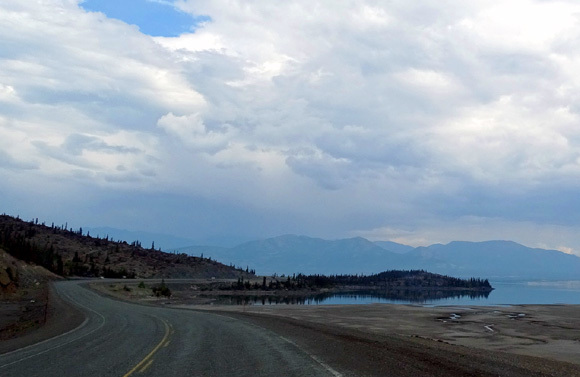 The water on both sides of the road at the southern end of the lake was much lower than when we passed through there in June and September, 2012, testament to the low snowfall this past winter. 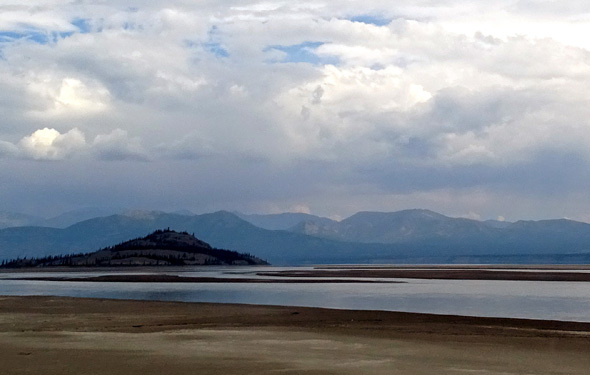 Dry lake bed along the driveway to the Sheep Mountain visitor center; it was under water in 2012. Jim rode his bike a couple miles with Casey on the little-traveled highway after we ate a late supper, then began a ride by himself.